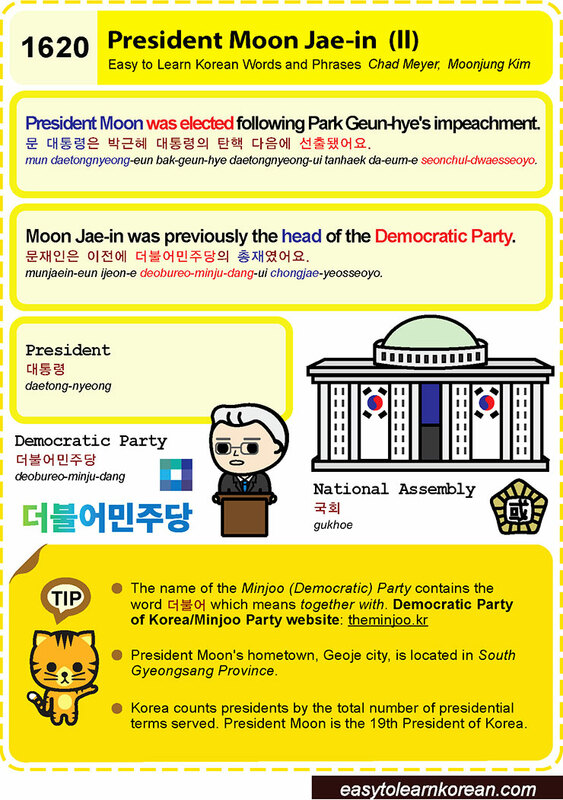 Easy to Learn Korean 1620 – Moon Jae-in (part two). This entry was posted in Series and tagged Democratic PArty, Geoje, MinJoo Democratic Party, Moon Jae-in was previously the head of the Democratic Party., National Assembly, President, President Moon was elected following Park Geun-Hye's impeachment., South Gyeongsang Province, theminjoo.kr, 국회, 대통령, 더불어, 더불어민주당, 문 대통령은 박근혜 대통령의 탄핵 다음에 선출됐어요., 문재인은 이전에 더불어민주당의 총재였어요. by easykorean. Bookmark the permalink.